Cut the Brinjol into thin slices. For batter :- add chana flour, chilly powder, rice flour, hing, salt and little water and make thick paste. 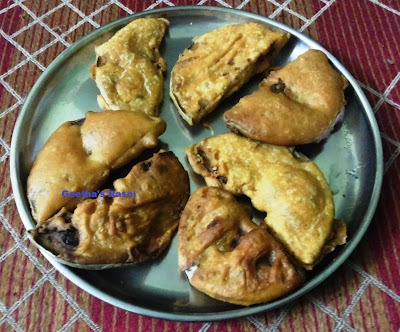 Heat oil in kadai, dip the brinjol slices into the paste and cover it fully and deep fry. Brinjol fry is ready to eat a snack or side dish for lunch.